Master's in the Dental Clinic, Federal University of Juiz de Fora, Juiz de Fora, MG, Brazil. Graduate Student in the Dental, Federal University of Juiz de Fora, Juiz de Fora, MG, Brazil. Doctor in Philosiphy (Oral Biopatology); Coordinator Program Postgraduate Master in Dental Clinic, Federal University of Juiz de Fora, Juiz de Fora, MG, Brazil. Para efectos de referencia bibliográfica este trabajo debe ser citado de la siguiente manera: Theodoro Batista C., Rocha Coelho P., Malta Ferreira K., Afonso Miranda Chaves M.
"DIGITAL PHOTOGRAPHY IN DENTISTRY: TECHNIQUES AND CLINICAL IMPORTANCE." More than any other health specialty, Dentistry has benefited from the trends and advances in digital photography, and a well designed protocol of dental photography may be a great contribution for the orthodontic practice. Digital records may be used for several purposes, including patient records, treatment evaluation, patient counseling, didactic and medico-legal uses, as well as to present the quality of procedures for marketing purposes. A good for dental photography protocol may greatly enhance the dental practice. The aim of this article is to describe scientific and technical information in detail to provide a guide for dentists who wish to use photography more effectively. This article also addresses some relevant questions for the selection and applicable settings of semiprofessional and compact digital camera systems to enhance the achievement of good-quality and well-focused photographs. Keywords: Photography, dental photography, documentation. Más que cualquier otra especialidad de la salud, Odontología se ha beneficiado de las tendencias y los avances en la fotografía digital, y un protocolo bien diseñado de la fotografía dental puede ser un gran aporte para la práctica de ortodoncia. Los registros digitales se pueden utilizar para varios propósitos, incluyendo los registros de pacientes, la evaluación del tratamiento, orientación de los pacientes, los usos didácticos y médico-legales, así como para presentar la calidad de los procedimientos para fines de marketing. Una buena para el protocolo de fotografía dental en gran medida puede mejorar la práctica dental. El objetivo de este artículo es describir la información científica y técnica en detalle para proporcionar una guía para los dentistas que desean utilizar la fotografía con más eficacia. Este artículo también aborda algunas cuestiones relevantes para la configuración de la selección y aplicación de sistemas de cámaras semiprofesionales y compactas digitales para impulsar la consecución de fotografías de buena calidad y bien enfocado. Palabras clave: Fotografía, fotografía dental, documentación. Though recent, the introduction of this feature in the dental clinic has been increasing. (6) Photographs are fundamental for record keeping in clinical dentistry and represent a valuable resource in Orthodontics (4). Thus, the aim of this paper is to provide information for obtaining photographs more effectively, as well as to contribute with some relevant questions for the selection and applicable settings of digital systems of semiprofessional and compact cameras, with a view to enhance the achievement of photographs with good quality and focus. This technology has presented great evolution in the recent years, leading to the utilization of digital imaging in Orthodontics. The knowledge on digital photography aided the use of resources that enhanced the diagnostics, communication between professionals, laboratory technicians and patients, scientific illustrations, applications for didactic, counseling, research and publication purposes. (8, 9) Trevisan et al4 and Machado6 further mentioned the possibility of immediate visualization of the result of photographs, no costs with films and processing, and systematic management of images in the clinic as the main advantages of digital photography. 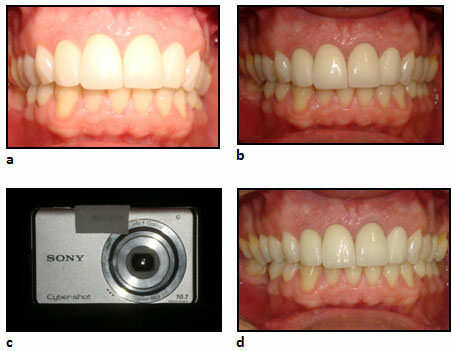 Machado et al (12) investigated the accuracy of orthodontists in differentiating conventional and digital photographs as well as checking their quality. For that purpose, ten digital and ten conventional photographs of excellent quality were printed on photographic paper with a resolution of 400 dots per inch (DPI) in a professional digital lab. The examiners indicated if the images had been obtained by conventional or digital cameras and judged the quality of each photograph. 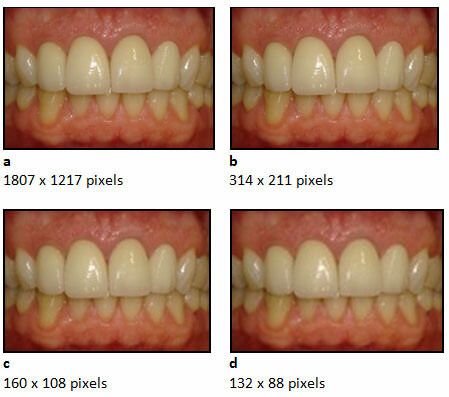 The authors concluded that the quality of digital photography is well acceptable for application in Orthodontics. Conversion of the image known as one pixel, which is the basic unit of image detail, is derived from the abbreviation of picture element. (1) Pixel is a single point that forms the image, corresponding also to the grain on the conventional paper images. The greater the number of pixels, the higher the image resolution or its fidelity, (2) as shown in Figure 1, in which all photographs are the same size (3.7 x 5.42 cm) but have different resolutions in pixels. If they were printed in this size, the quality of the first two (a and b) would be similar and progressively worsened in the other two (c and d). For further information on this aspect, observe the Table 1. The photographs show the different image resolutions yet with the same dimension (3.7 x 5.42 cm) - (a) 1807 x 1217 pixels; (b) 314 x 211 pixels; (c) 160 x 108 pixels; (d) 132 x 88 pixels. Machado et al (11) have emphasized that the resolution in megapixels (MP), which is often the main aspect advertised by manufacturers, is only one among several features that should be considered when choosing a digital photographic equipment. They concluded that the resolution in the MP per itself does not assure high-quality images, but rather only when associated with lenses with excellent optical quality and a proper lighting system. Currently, there are digital cameras with 28MP resolution, allowing users to print images with high resolution of 300 DPI and sizes up to 52 x 39 cm. (6) The quality of images produced is the same when it refers to (1,2,3,4) or more MP, yet the final size of the image influences the file size. (13) Therefore, if these photographs are printed, the resolution of the camera will be related to the maximum size that the image can be enlarged on photographic paper.16 Thus, the resolution of photographs used for printing, scientific posters or publications will be directly related to the image size used, as shown in Table 1. Resolution and size of image printing in centimeters (Machado et al, 2004 11). The actual resolution in which the image is captured may not be important if there is no need for photo-quality printing, thus setting the camera to record at lower resolutions can be helpful (1). Machado (6) has suggested the purchase of digital cameras compatible with the current market standard (10 to 15MP), yet the equipment should be set to work at lower resolutions (5MP, for example), meeting the routine needs with high quality. The camera may be set to the highest resolution possible when printing in larger sizes is necessary. The images displayed on computer screens present average resolution of 72 DPI. Conversely, digital projectors have a resolution of 0,8 MP or 1024 x 768 pixels. (13) Therefore, when photographs are obtained to be displayed on the internet, sent by e-mail and viewed on a computer screen or in multimedia presentations, a resolution of up to 2 MP (1600 x 1200 pixels) (13) may be used. However, Hutchinson and Williams1 reported that these projected images do not lose details when they are created at resolutions greater than 1.3 MP. Accordingly, Machado6 in 2010 reported that images with resolution of 3 to 5MP meet those needs with good quality, while Morris8 suggested a minimum resolution of 6 MP. The focus is reached moving the camera forward and backward to adjust the required distance, then the shutter button should be partially pressed to ensure the correct focusing by the camera. (2,14,15) The macro mode should be enabled in intraoral photographs. The correct framing is achieved with the aid of references according to the type of photograph desired. Lip retractors provide a great contribution to the final outcome of intraoral photography. Two sizes are needed and the dental assistant should be trained for their utilization. Larger retractors are used for photographs in frontal view in 95% of patients, yet smaller retractors should be used in lateral view to provide greater horizontal than vertical retraction. Before taking the photograph, the retractor should be pulled as distally as possible to achieve an angle as perpendicular as possible to the molars and premolars. This will allow reproduction of the buccal segment of the sagittal discrepancy and also ensures observation of the distal aspect of first molars on the photograph. (16) In order to enhance the possibility of achieving good-quality and well-focused photographs, two or three shots should be achieved for each view and then the best image is selected. 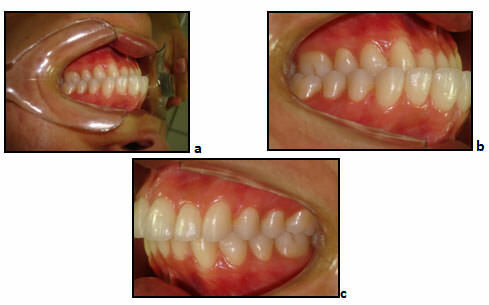 Most digital cameras have the flash connected laterally or above the objective (point flash), which produces an uneven distribution of light in the intraoral photography, creating unwanted shadows, which may be noticed as a shadow in the buccal corridor of the patient14, 15 on Figure 2. Overexposed photograph (a), represented by excess lighting. Mainly the right buccal corridor was dark (b), without uniform distribution of light due to flash positioning on the right side of the camera (c). Correct lighting (d). The literature has reported several adjustments to eliminate these disadvantages. The light intensity emitted may be regulated by trial and error, adjusting layers of masking tape, coffee filter paper or tracing paper over the flash to get the necessary attenuation of light intensity (2,4,11) (Fig. 2 b), or alternatively by reducing the flash intensity on the camera settings. The correct lighting allows the observation of nuances and details of the teeth and periodontal tissue. Compare the photographs in Figure 2 (a) and (c). Some authors (1) proposed turning on the dental unit light and turning off the flash, stating that the observation of teeth would be enhanced, yet this became unnecessary in cameras that allow adjustment of light intensity. Also, with a view to control the amount of light that will sensitize the camera CCD, some cameras allow adjustment of the exposure compensation, which varies from -2 to +2 in the average. Ideally, the intensity should be regulated as low as possible, compatible with the distance used in intraoral photographs. The equipment instructions should also be read to facilitate the adjustments in the equipament. (5) Thus, some trials may be performed for the achievement of more or less light according to the desired goal (11). McKeown et al (14) suggested that, when achieving intraoral lateral photographs with cameras with a laterally connected flash, the camera may be rotated in horizontal direction to allow illumination of the area that would be shaded by the cheeks or retractors. Moving the camera further back from the patient may also allow light diffusion and better lighting of the area, yet a larger field would then be photographed. In that case, the image should be trimmed and rotated at 180° (Figure 3). The area that would be shaded on the lateral view was illuminated by rotating the equipment at 180° (a and b), so the flash was on the left side of the camera. After trimming and rotation in an image editing software (c). High-quality photographs in occlusal view are difficult to obtain with point flashes due to the proximity between patient and camera, which produces shadows. Besides the great distortion of the captured image, there is unwanted condensation of water vapor on the camera lenses because of patient breathing, causing loss of image quality. (4) McKeown et al (14) suggested focusing as distant from the mouth as possible, providing more light and reducing the shadows. In this situation, the area of interest represents only 20% of the area captured by the camera. 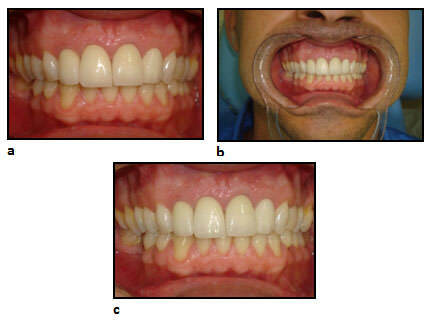 Therefore, the picture must be trimmed saving only the area of interest, either lateral or occlusal. For that purpose, the camera resolution should be as large as possible to produce a good image after trimming, since 80% of the photograph will be discarded (Figure 4). Use of point flash with insufficient illumination of the object, due to the proximity of the camera (a). Focusing from a more distant position allows better illumination and greater area of capture, thus requiring higher resolution (b). In (c) trimming of the area of interest exhibiting good lighting. The high rate of innovations in the market often confounds dental professionals in the world of digital photography, which has been adopted by all dental specialties and became an important resource. Photographs can be easily obtained using the correct equipment, proper settings and the most effective techniques, thereby increasing the chances of obtaining high-quality images. Hutchinson I, Williams P. Digital cameras. Br J Orthod. 1999 Dec;26(4): 326-331. Oliveira JP, Martins MF. Fotografia intra-oral. 1ª ed. São Paulo: Editora Santos; 2004. 132 p.
Sandler J, Dwyer J, Kokich V, McKeown F, Murray A, McLaughlin R, et al. Quality of clinical photographs taken by orthodontists, professional photographers, and orthodontic auxiliaries. Am J Orthod Dentofacial Orthop. 2009 May;135(5): 657-662. Trevisan F, Scanavini MA, Maltagliati LA, Gonçalves RR. Adaptações em câmera digital compacta para obtenção de fotografias intrabucais. R Clin Ortodon Dental Press. dez 2002 / jan 2003; 1(6):81-86. Christensen GJ. Important clinical uses for digital photography. J Am Dent Assoc. 2005 Jan;136(1):77-70. Machado AW. O que há de novo em fotografia digital? R Dental Press J. Orthod. 2010 mar/apr;15(2):20-23. Sandler J, Murray A. Manipulation of digital photographs. J Orthod. 2002 Sep;29(3):189-194. Machado AW, Souki BQ. Simplificando a obtenção e a utilização de imagens digitais - scanners e câmeras digitais. R Dental Press Ortodon Ortop Facial. 2004 jul/aug;9(4):133-156. Machado AW, Leite EB, Souki BQ. Fotografia digital em Ortodontia: Parte IV - Sugestão de equipamento. J Bras Ortodon Ortop Facial. 2004 jul/aug;9 (52):323-327. Machado AW, Oliveira DD, Leite, EB, Lana AMQ. Fotografia digital x analógica: a diferença na qualidade é perceptível? R Dental Press Ortodon Ortop Facial. 2005 jul/aug; 10(4):115-123. Abelson MN. Parameters for digital imaging: Part 1. Am J Orthod Dentofacial Orthop. 1999 Nov;118(5):580-582. McKeown HF, Murray AM, Sandler PJ. How to avoid common errors in clinical photography. J Orthod. 2005 mar;32(1):43-54. Sandler J, Murray A. Digital photography in orthodontics. J Orthod. 2001 Sep;28(3):197-201. Sandler J, Murray A. Recent developments in clinical photography. Br J Orthod, London. 1999 Dec;26(4):269-272.